Posted on March 26, 2019 by Oliver Milman, Environment Reporter, Guardian U.S.
A string of small Missouri towns prepared for the next deluge along the raging Missouri river on Wednesday after flooding wreaked nearly $1.5bn in damage in Nebraska, killing at least four people and leaving another man missing. Surging waters after a late winter storm have already damaged hundreds of homes in the midwest this week, and been blamed for at least three deaths, two in Nebraska and one in Iowa. The flooding led to trains being halted in Missouri, creating transportation problems for people and products. It also has taken a heavy toll on agriculture, inundating tens of thousands of acres, threatening stockpiled grain and killing livestock. 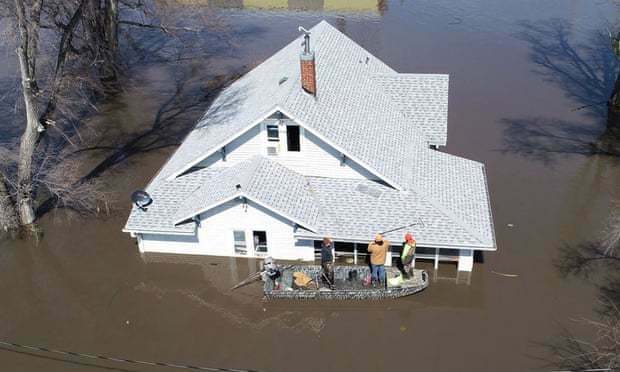 According to last year’s U.S. government climate assessment, increasing precipitation has already increased flooding risks in the midwest, causing widespread damage to property, soil erosion and water quality problems. One Mississippi region protected by levees is also flooding. That’s because smaller rivers can’t drain into the Mississippi river as normal because a floodgate that protects the region from even worse flooding by the big river has been closed since 15 February. Around Rolling Fork, Mississippi, townspeople first noticed water rising from swamps near the Mississippi river in late February. The water eventually invaded some homes in that community, about 40 miles (65km) north of Vicksburg. Sweet said NOAA expects the mid-Atlantic region, stretching from New Jersey to Virginia, to experience a massive increase in flooding days, up from around 10 days to as many as 130 days a year, by 2050. “The numbers are staggering, some places will be flooding almost every other day,” he said. This post originially appeared on The Guardian's website and can be viewed here.